Two expert Lego builders have crafted a life-sized Volkswagen camper van using 400,000 bricks. Unveiled at the f.re.e leisure and travel fair in Munich, the impressive model reportedly took just six weeks to build. 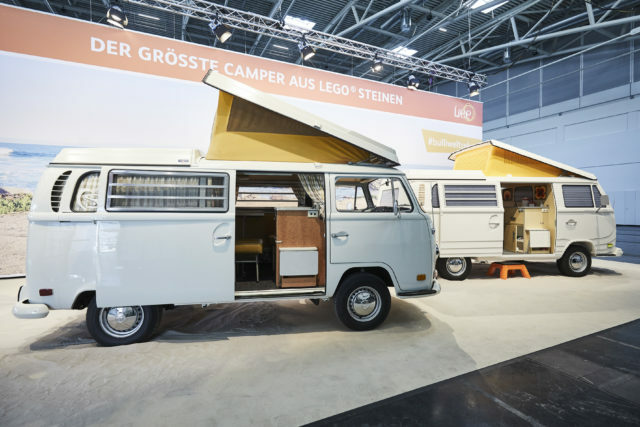 Rene Hoffmeister, one of 12 people in the world recognised as a Lego Certified Professional, and friend Pascal Lenhard teamed up to craft the 700kg T2 Bulli. The pair produced a 3D imaging construction plan in advance to help them complete the impressive project – although it wasn’t without its issues. Faced with a shortage of transparent bricks late in the venture, the creators were forced to ‘work’ night shifts to present the model at the fair. It’s fair to say the final project turned out impressively though. It’s more than five metres long, 1.9m wide and even features a pop-up roof that takes the overall height to above three metres. Inside the van, there’s also an array of fittings crafted from the brick-building system. While this project wasn’t officially sanctioned by Lego, the Danish toy company is known to take on similar feats. Last year, it created a life-sized Bugatti Chiron using more than a million elements from its Technic range of components – with the model even driveable to a top speed of ‘over’ 12mph.